Anyone notice that if you are logged onto your Google Adsense account, Google Groups account, or Google Gmail account that the Google home page now includes a "Personalized Home" option, "My Account" option, and "Sign Out" option? And if you aren't logged in yet, the Google Home page gives you an option to sign on via a link in the upper-right hand corner. 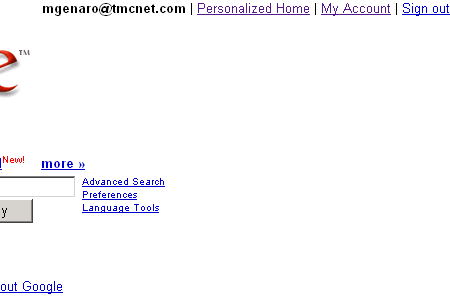 Here's a screenshot of the upper-right hand corner of my browser showing the new options available on Google. When you go into My Account, I was hoping for some sort of "unified portal" depicting various statistics and information across all of my Google accounts (i.e. unread email, daily Adsense revenue, etc. ), but alas, it's simply hyperlinks to the various Google offerings. I wonder how long has Google's home page has had this feature. For all I know it's been there for weeks and I've just been too busy to notice. Anyone know?